Commute by bike in Chicago! The hell with cancer! Turning my daily ride to radiation treatment into something bigger. I had been kicking myself for the last couple of weeks. I thought I had missed an opportunity to do something really good and worthwhile. But, of course, regret is a wasted emotion. And upon further reflection (and the urging of friends), I decided I could still do something good and worthwhile! I’m nearing the end of my post-surgery treatment for residual prostate cancer under the care of Dr. Stanley Liauw at the University of Chicago Hospitals in Hyde Park. The treatment consists of hormone therapy and 38 radiation treatments, delivered five days a week, Monday through Friday, for seven-and-a-half weeks. My first treatment was May 29, the day after Memorial Day. My final treatment will be this coming Monday, July 23. I have been riding my bike early on weekday mornings from our home in Evanston, along the length of Chicago’s spectacular lakefront, and down to Hyde Park for every treatment, stopping downtown for work on the way back north, and finishing the ride back to Evanston in the evening. That’s 44.7 miles of riding a day. Add in an extra day when I rode down to Hyde Park only to have a treatment canceled (due to an equipment malfunction), and I will have ridden nearly 1,800 miles to and from my radiation treatments! That’s like riding from Chicago to Las Vegas (without the dancing girls, Wayne Newton or Cirque du Soleil). At the beginning of all this, I didn’t know if I would be able to ride every day. The side effects of hormone therapy and radiation are numerous, including, but not limited to, fatigue, menopause (and its assorted symptoms), nausea and the dreaded (I just recently learned the medical term for this) “rectal urgency.” (Oh boy…) The third day I rode (May 31) was pouring rain and 49 degrees. I rode anyway, figuring, “If I can ride in this, I can ride in anything.” The 90-100 degree days have been a snap, especially with the help of a few cycling friends – my darling wife, Carol, Frank Shaw, Tom Waterloo, Tom Arndt and Steve Schwartz – who have ridden with me to treatment and allowed me to draft off of them! In addition, numerous friends from the Millennium Park Bike Station gave me a lift when I needed one. Thanks to all of you, as well! That said, the reason I was kicking myself was that I should have done all of this bike riding as a fundraiser for Dr. Liauw’s research! 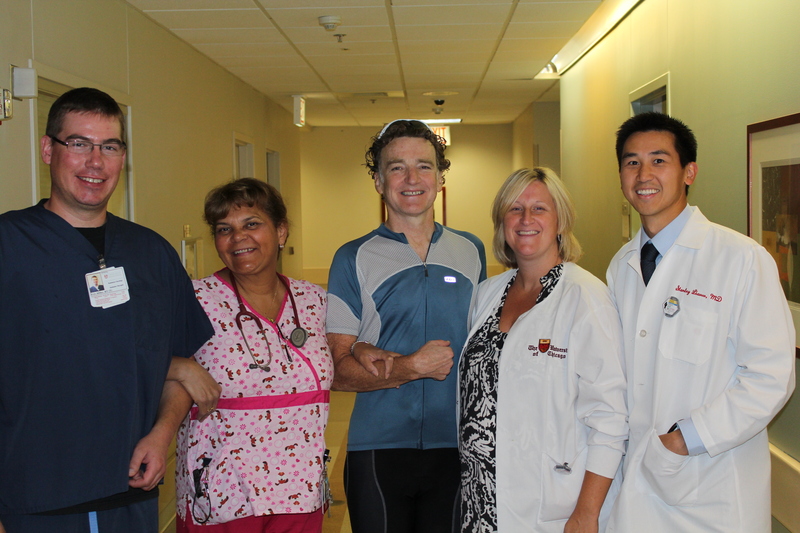 Part of the great U of C team (from l to r): Eric, radiation therapist and a serious cyclist in his own right who commutes 19 miles each way to the hospital; Denise, The-Nurse-Who-Knows-All, Dr. Liauw’s right hand and also the world’s foremost expert on hormone injections (OUCH! ); my sweaty self; Meghan, radiation therapist and possessor of an extraordinary laugh that turned hard days into good days; and Dr. Stanley Liauw, a guy who is changing the world for the better. Stan Liauw is an impressive person. He is intelligent, compassionate, honest and humble. When I told him that I would like to raise some money for his research (more on his research in a moment), he was welcoming, but quite humbled and grateful. He told me that even a couple thousand dollars would go a long way, allowing him to hire some graduate students to do, as he said, so much of the “grunt work” involved in clinical research. So I am asking my friends and family members if they would do me a big favor and contribute to a fund dedicated to helping Stan’s research projects. The fund is marked specifically for his work and not for the institution, at large, meaning you can rest assured that any donation you give will be going directly to the important work Stan is doing. My one major regret is that I could have probably suggested a commitment of a dollar for every mile cycled, and many of you would have agreed without thinking, leaving you on the hook for $1,750! (Okay, some of you would have been smart enough to ask, “So how many miles do you figure?” and opted to be in for 10 cents a mile, whittling your obligation down to $175.) That said, anything you can give to the fund would be greatly appreciated by me, but more importantly, it would be appreciated by Stan and his team. Throughout my cancer journey, I have been blessed to be surrounded by truly exceptional doctors and their excellent staffs, starting with an incredible group of physicians at Northwestern: my friend, Dr. Daniel Derman, who shepherded me though this entire process; my internist, Dr. Erik Orelind, who not only stayed on top of the myriad tests I needed, but went out of his way to make the process as easy as possible; Dr. Robert Nadler, my initial urologist who studied my steeply-rising PSA and ultimately performed the biopsy that confirmed my aggressive cancer; and Dr. William Catalona, the legendary, deft surgeon who operated on me. And finally, there’s Stan Liauw, a young doctor who, I guarantee, will be making an even bigger impact than he already has on helping people overcome cancer. One thing all of these doctors have in common – and it is clear in every interaction with them – is their deeply-held commitment to helping people. I feel quite fortunate and thankful to have had the value of their counsel, knowledge and skill during my cancer. “Stanley Liauw’s Research—Pat Navin fund” should be written in the memo line to ensure proper allocation and attribution. Thank you in advance for any contribution you can make. Thanks, too, for all the love and support you have sent to our family. We are extremely grateful for the many kindnesses shown to us. And if you want to go for ride down the lakefront to the south side, give me a call or drop me an email. I’d be happy to join you and I know it like the back of my hand! Dr. Liauw has been running the prostate cancer program within the Department of Radiation and Cellular Oncology at the University of Chicago for 6 years. While his priority is to provide excellent care for his patients, he is also actively involved with multiple research projects to help improve outcomes for men with prostate cancer who are treated with radiation. These efforts include prospective collection of data for men treated at the University of Chicago, with periodic outcomes analysis; multi-institutional studies regarding prostate cancer control and side effects of therapy; clinical trials aimed at improving cancer control and/or quality of life after treatment; and scientific research regarding mechanisms of radiation sensitization and radiation resistance. So far, these efforts have led to more than 30 scientific presentations at meetings, and 15 scientific manuscripts. Support of his research would be applied towards the development of his research program in prostate cancer, with the goal of making continual gains in our understanding of this disease, and providing the best possible therapy for our patients. streetfilms.org, home of Clarence Eckerson, Jr.